Morten’s new album Brother is released in Norway, Germany, Austria and Switzerland today. The UK release is on Monday. Morten spent yesterday meeting the Norwegian press at The Thief hotel in Oslo, which has resulted in interviews in Aftenposten, Dagbladet, Dagsavisen, Adresseavisen and Budstikka today. There is also a 7-page interview in Dagens Næringsliv’s weekend magazine. It has been posted online at dn.no as well. Today he’s done more radio promo, starting with Nitimen on NRK P1, where he did an acoustic version of “Do You Remember Me” with Dan Sunhordvik. The interview and performance can be heard on nrk.no. There is also a picture and a video clip from the rehearsals on Nitimen’s Facebook page. Later on he was a guest on Michael Direkte on P4, a few audio clips have been posted on p4.no. Morten and Dan have also done a live session for VGTV. The performances of “Do You Remember Me” and “There Is A Place” can be viewed at vgtv.no. The album reviews are generally favorable, with Aftenposten (5/6) being the most positive so far. “The title track’s longing melancholy, naked sensitivity and timeless reflection on the term identity, sets the standard”, Aftenposten’s reviewer writes. He also mentions the “believable intensity of the songs” and how Morten “has let the music develop naturally and harmonically” this time. Vårt Land’s reviewer feels it’s “without a doubt his most existential, wonderingly, even sacral and religious album that he’s made on his own”. Bergens Tidende feels the album is “a step in the right direction”, compared to “the forgettable Out Of My Hands”. Drammens Tidende expects the album to be a commercial success, “because of the many catchy, radio-friendly songs”. 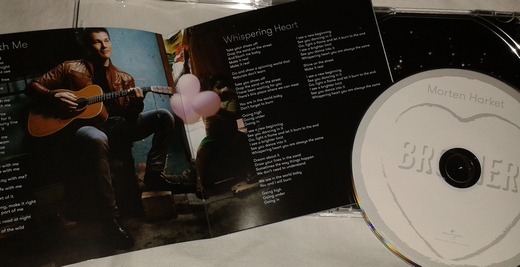 Bergensavisen highlights the songs “Whispering Heart”, “Brother” and “There Is A Place”, but feels “the album is a little uneven as a whole”, partly because of the lyrics. Both VG and Dagbladet (3/6) are rather lukewarm in their reviews. “Brother has been produced to death by the Swede Peter Kvint; who I’m sure is a nice guy, but why should Morten f***in’ Harket work with these anonymous, mediocre collaborators?”, VG’s reviewer asks. Dagbladet feels that the album “starts well, but fades away into a series of semi-ballads that don’t take him anywhere he hasn’t been before”. 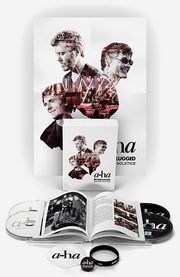 Over on a-ha.com, the Q&A with Peter Kvint has now been posted. “We had fifteen finished songs (written and produced) and out of those we chose the ten songs that made it to the album. Some of the other songs (like “Did I leave you behind”) will be released later in some form”, he says in one answer. Read the whole thing here. 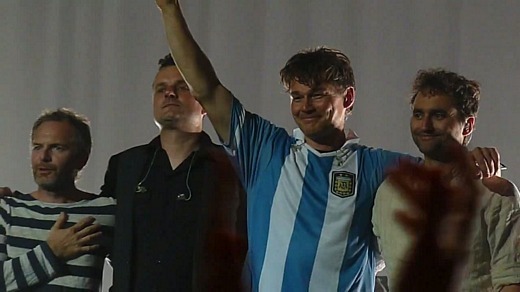 Morten is now in the UK to promote his new album. 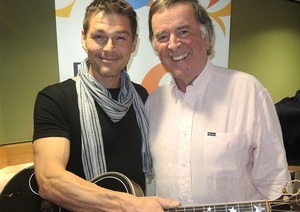 This morning he was a guest on Weekend Wogan on BBC Radio 2, where he did two acoustic songs together with Dan Sunhordvik; “Do You Remember Me” and – as a tribute to Phil Everly – “Let It Be Me”. The performance is available here. More pictures here and here. Later on he was a guest on Gaby Roslin’s show on BBC Radio London, where he did two more songs together with Dan; “Do You Remember Me” and “Safe With Me”. He also talked openly about being bullied as a child. The show can be heard here (for 7 days). 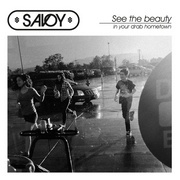 Pictures here and here. He also met Maajid Nawaz today, whose book Radical was a source of inspiration for the lyrics in “Brother”. 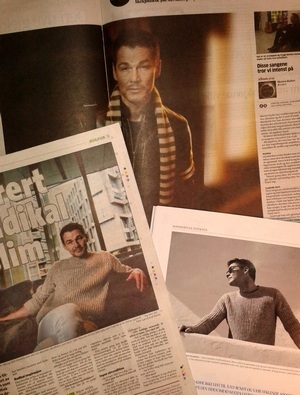 “Just met A-Ha lead singer @mortenharket to thank him for writing new album-track “Brother” based on my memoir Radical”, Nawaz said in a message on Twitter. The UK promo continues tomorrow with more radio interviews, plus a TV-appearance on ITV’s Lorraine. 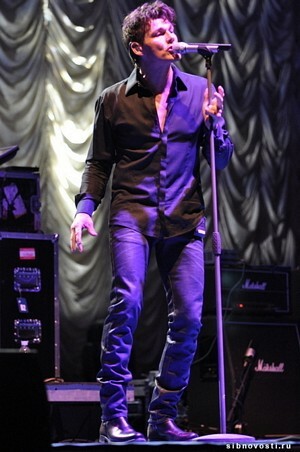 Check out mortenharket.com for the details. 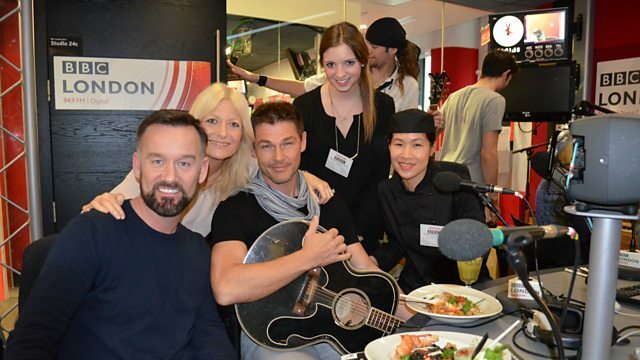 Before going to London, Morten and Dan did another acoustic session for Radio Norge in Oslo on Friday. But I don’t know if it was broadcast live or recorded for later. Pat Sharp, who was also a guest, posted a selfie with Morten on Twitter. Additional pictures here and here. 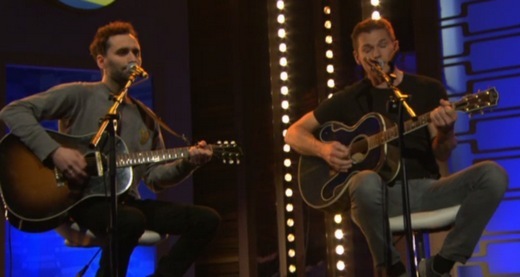 Morten and Dan Sunhordvik’s acoustic performance of “Brother” on the talkshow SWR3 Latenight aired in Germany last night. The performance, which was taped in Baden-Baden on Wednesday, can be seen here (starts at 24:30 minutes). 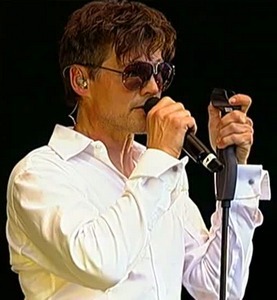 Apparently Morten’s in-ear monitor couldn’t be used, so the odd-looking thing on his cheek was an improvised solution.